Part of Folkestone Town Centre will be transformend into a new park, designed to be used by all sections of the community. The area known as Payers Park will be extensively landscaped and redesigned so as to offer an oasis of green space between the Creative Quarter, Grace Hill and Rendezvous Street. Preparatory work began on Monday 10 February to enable completion of the project in time for this year’s Folkestone Triennial exhibition, “Lookout”, which begins on 30 August. The new park will occupy a prime position, and will incorporate views through existing mature trees across the sloping site. 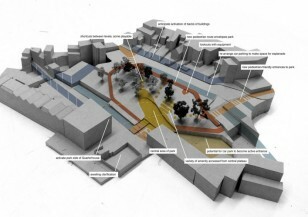 Amenities will include a graded boardwalk and other walkways, seating, planted and grassed areas, and a central plateau, all designed to provide a focal point and destination for residents, visitors and shoppers, as well as improving access between areas of the town centre that are currently disconnected. The current car parking spaces will be retained, but realigned so as to present the entire area more attractively. The new park has been conceived as a contribution to the 2014 Triennial, which is managed by the Creative Foundation, and commissioned from urban design specialists muf Architecture, whose work includes the Altab Ali Park in London’s Whitechapel. The design process included community consultations and a series of events involving local people to help ensure that the area’s heritage and past usage is reflected in its future use. The site has been dilapidated, unused and without any designated purpose for many decades, and is now being made available for public use through a partnership between The Roger De Haan Charitable Trust, Kent County Council and Shepway District Council, who will manage the park under an arrangement that also allows them to manage the car park spaces. Photo: Plan of the new park in Folkestone Town Center. Countesy Folkestone Triennial.